Ellen Hopkins stands out thanks to her amazing ability to confront some of the toughest issues teenagers confront in a realistic manner, and for her unique, incredible style. Her book covers have always had a distinctive style and shape that make them easily recognizable as hers, and her latest book, Perfect , is no exception. I just adore it--it is most definitely my favorite cover of hers so far! I love the colors, and the way the purple bleeds away from the letters. The font is amazing. It really manages to demonstrate that perfection and beauty may not be all it's cracked up to be. Very striking! "Everyone has something, someone, somewhere else that they’d rather be. For four high-school seniors, their goals of perfection are just as different as the paths they take to get there. Cara’s parents’ unrealistic expectations have already sent her twin brother Conner spiraling toward suicide. For her, perfect means rejecting their ideals to take a chance on a new kind of love. Kendra covets the perfect face and body—no matter what surgeries and drugs she needs to get there. To score his perfect home run—on the field and off—Sean will sacrifice more than he can ever win back. And Andre realizes to follow his heart and achieve his perfect performance, he’ll be living a life his ancestors would never understand. 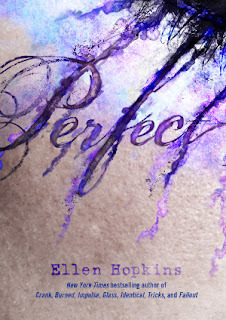 A riveting and startling companion to the bestselling Impulse , Ellen Hopkins's Perfect exposes the harsh truths about what it takes to grow up and grow into our own skins, our own selves." Perfect will be out on September 13th, 2011! I like how the cover and the meaning of the word "pefect" are conflicting. Not sure if I like the image - but I can see how the real thing will look absolutely stunning! I know! I love this cover too.